Don't worry, we didn't die. There weren't enough hours in the day to die. This is a post to prove we still live. Just barely. But we live. This farming year really started way back in December when we began making plans for the farm. We needed to secure land, a whole bunch of tools (some expensive, like the tractor), and seeds. We needed to figure out how we were going to make a living in our inaugural year, knowing full well that first year small farmers don't really make money from the farm. With a rough plan in place, seeds ordered, and plant starting materials procured, the first seeds were started in my bedroom in February. In March and April we moved everything to the farm and started a whole bunch of plants in a small hoophouse we built from scratch for a few hundred dollars. Things started going in the ground in early April. Our new tractor broke down and needed a clutch early in the season. We fixed it ourselves and continued going. 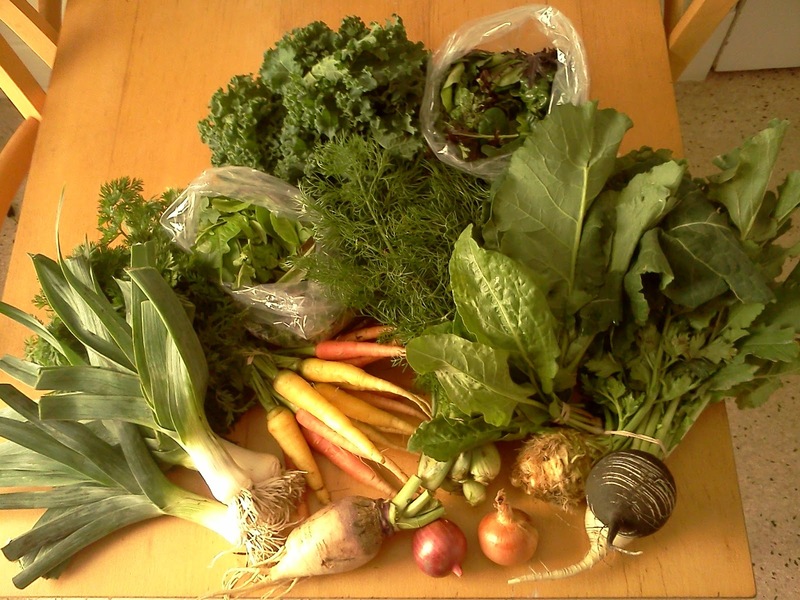 In mid-June, we delivered our first share of produce. It's been five months since we sent those shares out. Finally, with a little bit of time to breathe we can look back and see how everything went. We think the season started out a little rough because of a late frost and extreme early heat. Some things died in the frost, and other things went to seed or got stunted early because of the heat and were therefore unusable as food for most people. We had some early season scares and losses due to a lack of water. Spring carrots and lettuce mix all died in the drought. Tomatoes and lovage almost died, but we were able to give them just enough water to make it, and we actually think they fared better because of the stress. I'm not saying those tomatoes were the best I've ever had. Wait. Yes I am. It was the drought though, not us, who made those things taste so good. A lack of water helps concentrate sugars in the fruits of the tomato plants. But we could have done without the death scare. A combination of ground squirrels and cucumber beetles did a number on our squash plants. We fought them as best we could (with our bare hands!) and, in the end, we think we were able to harvest the perfect amount of cucumbers and summer squash, but wish we could have gotten a little more winter squash out of the deal. But it is what it is. It was the worst cucumber beetle invasion we've ever seen, so, all in all, we're happy with what we got out of it. Disease took out our sunflowers (the seed part, not the plant) and dry beans. At least they served the purpose of providing beauty, nectar for insects, and in the case of the beans, fixing nitrogen from the air into the soil. The weeds went crazy this year when we did get sporadic rain, and tending to their destruction caused us to get some of our fall plants out a little later than we would've liked. And the fall turned out to be colder than normal, which slowed down crop growth. So, we apologize for not having fall broccoli, cabbage, and Brussels sprouts. We also wish we could've given out more in the way of fall roots. But we were able to figure out the carrot and lettuce mix thing, and we think they turned out great for the last few shares of the season. Looking back on it, despite some of the failures,we feel like we were able to provide more value than our customers paid for their shares, which is the goal for all good CSA farmers. We want our customers to share in the bounty. A bountiful year is good for everyone involved in the CSA partnership. We feel like the variety we offered is hard to find, and some of the weeks we had a hard time fitting all the produce in the delivery bags. Right now, the field is mostly put to bed. Winter rye and and mammoth red clover are growing, providing cover to the ground and helping renew the fertility of the soil. We need to find new land for next year, which is what our main focus is right now. After that, we will be moving all our stuff and getting ready for our second year. We don't get much of a break. Planning for next year will start soon. We will order seeds in January. We'll start our alliums and nightshades in February and March again. And we'll be making veggie deliveries in June. We think it was a great first year. Thanks to all our members for participating in our farm and making it a successful year. We hope you enjoyed your produce, and we hope you fell in love with a couple new veggies in the process. Next year will be even better, with new veggies and plenty of old favorites. We hope to see you all again in June (or earlier--you can come out and visit the farm as early as April if you want to help out or see how things get started). Three Plaid Farmers, 2016. All rights reserved. Powered by Blogger.